A corneal ulcer is a loss of corneal tissue, often associated with inflammation, and ulcerative keratitis is the general term for the group of disease processes leading to corneal ulceration, as well as the term for the inflammation that accompanies ulceration. Most corneal ulcers are infectious, including bacterial and viral etiologies. Noninfectious ulcers may be due to chemical burns or autoimmune, toxic, neurotrophic, or other causes. Because of its potential to permanently impair vision or progress to perforation and an open globe, a corneal ulcer is considered an ophthalmologic emergency. Although corneal ulcers may occasionally be sterile, most are infectious in etiology. Bacterial keratitis is the most important etiology to exclude in the emergency department (ED). Corneal infections and infectious keratitis are often presumed to be bacterial until proven otherwise. Common bacterial isolates cultured from patients with keratitis include P aeruginosa, coagulase-negative staphylococci, Staphylococcus aureus, Streptococcus pneumoniae, and Enterobacteriaceae (including Klebsiella, Enterobacter, Serratia, and Proteus). Klebsiella pneumoniae mucoid phenotype and its ability to form biofilm may be important in producing corneal ulceration. Agents such as N-acetylcysteine, may have a role in treatment because they inhibit biofilm formation. Ulcers due to viral infection occur on a previously intact corneal epithelium. With the introduction of topical corticosteroid drugs in the treatment of eye disease, fungal corneal ulcers have become more common. Fungi (Fusarium and Candida species) and parasitic amoeba (Acanthamoeba) have been found in a small number of patients and frequently present with more severe symptoms. 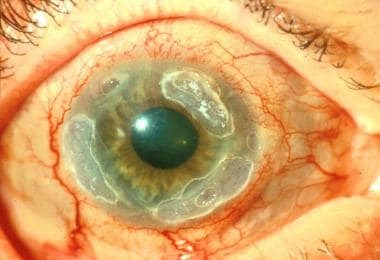 Peripheral ulcerative keratitis (PUK) is a complication of rheumatoid arthritis (RA) that can lead to rapid corneal destruction (corneal melt) and perforation with loss of vision. An example is shown in the image below. Peripheral ulcerative keratitis in the right eye of a patient with rheumatoid arthritis. Glue has been placed. Mooren ulcer is an idiopathic ulceration of the peripheral cornea that may result from an autoimmune reaction or may be associated with hepatitis C virus. It is a rapidly progressive, painful, ulcerative keratitis, which initially affects the peripheral cornea and may spread circumferentially and then centrally. Mooren ulcer can only be diagnosed in the absence of an infectious or systemic cause. Corneal scarring and vision loss are possible consequences. Studies from the United Kingdom suggest that males who wear extended-wear contact lenses are at increased risk of forming a corneal ulcer. Other studies suggest that males are at increased risk due to the higher probability of sustaining ocular trauma. Corneal injury or infection can affect people of all ages. A bimodal distribution is observed. The age groups with a higher prevalence of disease are likely tied to risk factors, those in the first group (< 30 y) who are more likely to be contact lenses wearers and/or sustain ocular trauma, and those in the second group (>50 y) who are more likely to undergo eye surgery. Infectious keratitis is significantly more common in contact lens wearers. Corneal ulcerations should improve daily and should heal with appropriate therapy. If healing does not occur or the ulcer extends, consider an alternate diagnosis and treatment. For excellent patient education resources, visit eMedicineHealth's Eye and Vision Center. Also, see eMedicineHealth's patient education articles Anatomy of the Eye, Corneal Ulcer, and Iritis. Jeng BH, Gritz DC, Kumar AB, et al. Epidemiology of ulcerative keratitis in Northern California. Arch Ophthalmol. 2010 Aug. 128(8):1022-8. [Medline]. Kosker M, Duman F, Suri K, Hammersmith KM, Nagra PK, Rapuano CJ. Long-term Results of Keratoplasty in Patients With Herpes Zoster Ophthalmicus. Cornea. 2013 Mar 27. [Medline]. French DD, Margo CE. Demographic patterns of ED patients diagnosed as having corneal ulcer. Am J Emerg Med. 2013 May 17. [Medline]. Morgan PB, Efron N, Brennan NA, et al. Risk factors for the development of corneal infiltrative events associated with contact lens wear. Invest Ophthalmol Vis Sci. 2005 Sep. 46(9):3136-43. [Medline]. [Full Text]. Efron N, Morgan PB, Hill EA, et al. Incidence and morbidity of hospital-presenting corneal infiltrative events associated with contact lens wear. Clin Exp Optom. 2005 Jul. 88(4):232-9. [Medline]. Rasoulinejad SA, Sadeghi M, Montazeri M, Hedayati Goudarzi H, Montazeri M, Akbarian N. Clinical Presentation and Microbial Analyses of Contact Lens Keratitis; an Epidemiologic Study. Emerg (Tehran). 2014 Fall. 2 (4):174-7. [Medline]. Kehe K, Szinicz L. Medical aspects of sulphur mustard poisoning. Toxicology. 2005 Oct 30. 214(3):198-209. [Medline]. The Wills Eye Manual: Office and Emergency Room Diagnosis and Treatment of Eye Disease. Philadelphia: Lippincott; 1994. Loh AR, Hong K, Lee S, Mannis M, Acharya NR. Practice patterns in the management of fungal corneal ulcers. Cornea. 2009 Sep. 28(8):856-9. [Medline]. [Guideline] American Academy of Ophthalmology Cornea/External Disease Panel, Preferred Practice Patterns Committee. Bacterial keratitis. San Francisco (CA): American Academy of Ophthalmology (AAO); 2008. [Full Text]. Park J, Lee KM, Zhou H, Rabin M, Jwo K, Burton WB, et al. Community practice patterns for bacterial corneal ulcer evaluation and treatment. Eye Contact Lens. 2015 Jan. 41 (1):12-8. [Medline]. Sharma N, Arora T, Jain V, Agarwal T, Jain R, Jain V, et al. Gatifloxacin 0.3% Versus Fortified Tobramycin-Cefazolin in Treating Nonperforated Bacterial Corneal Ulcers. Cornea. 2015 Oct 27. [Medline]. Miller D. Pharmacological treatment for infectious corneal ulcers. Expert Opin Pharmacother. 2013 Apr. 14(5):543-60. [Medline]. Acharya NR, Srinivasan M, Mascarenhas J, et al. The steroid controversy in bacterial keratitis. Arch Ophthalmol. 2009 Sep. 127(9):1231. [Medline]. Araki-Sasaki K, Nishi I, Yonemura N, et al. Characteristics of Pseudomonas corneal infection related to orthokeratology. Cornea. 2005 Oct. 24(7):861-3. [Medline]. Clewes AR, Dawson JK, Kaye S, Bucknall RC. Peripheral ulcerative keratitis in rheumatoid arthritis: successful use of intravenous cyclophosphamide and comparison of clinical and serological characteristics. Ann Rheum Dis. 2005 Jun. 64(6):961-2. [Medline]. [Full Text]. Frith P, Gray R, MacLennan S. The Eye in Clinical Practice. 1994. 77-95. Goldberg DF, Negvesky GJ, Butrus SI, et al. Ulcerative keratitis in mycosis fungoides. Eye Contact Lens. 2005 Sep. 31(5):219-20. [Medline]. Höfling-Lima AL, de Freitas D, Sampaio JL, et al. In vitro activity of fluoroquinolones against Mycobacterium abscessus and Mycobacterium chelonae causing infectious keratitis after LASIK in Brazil. Cornea. 2005 Aug. 24(6):730-4. [Medline]. Int Ophthalmol Clin. Contact lenses and external disease. Int Ophthalmol Clin. 1986. 26(1):1-166. [Medline]. Khanal B, Deb M, Panda A, et al. Laboratory diagnosis in ulcerative keratitis. Ophthalmic Res. 2005 May-Jun. 37(3):123-7. [Medline]. Krachmer JH, Mannis MJ, Holland EJ. Cornea: Fundamentals of Cornea and External Disease. 1997. 403-407. Leibowitz HM. Corneal Disorders: Clinical Diagnosis and Management. 1984. 353-372. Mirza SH. Fungal keratitis due to fusarium solani. J Coll Physicians Surg Pak. 2005 Sep. 15(9):576-7. [Medline]. O'Donnell C, Efron N. Contact lens wear and diabetes mellitus. Cont Lens Anterior Eye. 1998. 21(1):19-26. [Medline]. Pichare A, Patwardhan N, Damle AS, et al. Bacteriological and mycological study of corneal ulcers in and around Aurangabad. Indian J Pathol Microbiol. 2004 Apr. 47(2):284-6. [Medline]. Pinna A, Sechi LA, Zanetti S, et al. Detection of virulence factors in a corneal isolate of Klebsiella pneumoniae. Ophthalmology. 2005 May. 112(5):883-7. [Medline]. Seino JY, Anderson SF. Mooren's ulcer. Optom Vis Sci. 1998 Nov. 75(11):783-90. [Medline]. Servat JJ, Ramos-Esteban JC, Tauber S, et al. Mycobacterium chelonae-Mycobacterium abscessus complex clear corneal wound infection with recurrent hypopyon and perforation after phacoemulsification and intraocular lens implantation. J Cataract Refract Surg. 2005 Jul. 31(7):1448-51. [Medline]. Thomas JW, Pflugfelder SC. Therapy of progressive rheumatoid arthritis-associated corneal ulceration with infliximab. Cornea. 2005 Aug. 24(6):742-4. [Medline]. Vaughan D, Asbury T, Riordan-Eva P. General Ophthalmology. 1995. 124-133. Velasco Cruz AA, Attie-Castro FA, Fernandes SL, et al. Adult blindness secondary to vitamin A deficiency associated with an eating disorder. Nutrition. 2005 May. 21(5):630-3. [Medline]. Verhelst D, Koppen C, Van Looveren J, et al. Clinical, epidemiological and cost aspects of contact lens related infectious keratitis in Belgium: results of a seven-year retrospective study. Bull Soc Belge Ophtalmol. 2005. 7-15. [Medline]. Zaher SS, Sandinha T, Roberts F, et al. Herpes simplex keratitis misdiagnosed as rheumatoid arthritis-related peripheral ulcerative keratitis. Cornea. 2005 Nov. 24(8):1015-7. [Medline]. The authors and editors of Medscape Reference gratefully acknowledge the contributions of previous authors, Jerome FX Naradzay, MD, and Wesley S Grigsby, MD, to the development and writing of this article.